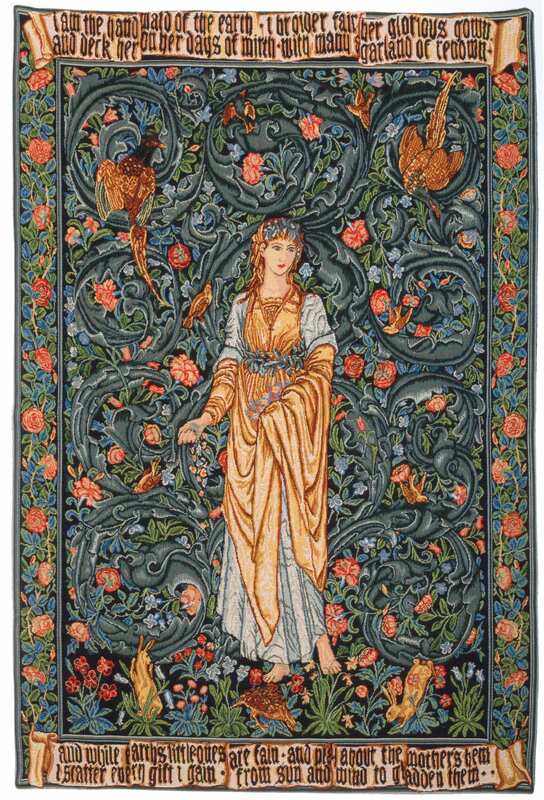 The Flora tapestry was designed by William Morris (1834 - 1896) and Edward Burne-Jones (1833 - 1898) in 1885. It depicts Flora, the goddess of abundance, who personifies summer, standing barefoot in flowing garments with a wreath in her hair. She holds fresh flowers in her hand and we can see the intricate floral background, inspired by the Medieval decorative technique known as Mille Fleurs (thousand flowers), demonstrating the artists' admiration for pre-Renaissance art. This wall tapestry is woven in Belgium on a jacquard loom with 100% cotton thread. It is lined with a cotton backing and is finished with a rod sleeve. The gobelin quality is obtained by a denser, thicker weft and as such is somewhat heavier than the regular tapestry quality.